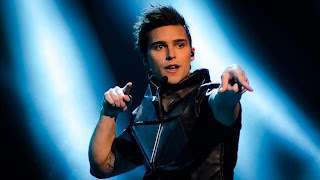 This week Eric Saade has visited X Factor to perform new single "Marching (In The Name of Love)" and he has quite properly explored his Melodifestivalen-experience of making a good TV-show. No, you won't see showers on the stage or broken glass but that intro with a lighting door and choreography breathes with something that could take a place at Melodifestivalen, don't you think? Eric claims that he has left Melodifestivalen behind but I quite clearly see him coming back in... 2015 maybe? Check the performance here and don't forget to click HQ, it's worth it.